The U.S. government’s debt, measured as a share of the economy, has more than doubled in the past decade – the consequence of growing annual federal budget deficits. Without changes in tax and spending policies, the debt is projected to climb to historically unprecedented levels over the next few decades. Washington Post: America’s Debt Has Exploded. Why Does No One Care? So how worried should you be? Some questions and some answers. Q: Why has the federal debt risen so much? During the Great Recession, the federal government ran large annual budget deficits – that is, it spent more than it took in – to shore up the economy. When the government runs a deficit, it borrows by issuing Treasury bonds. The federal debt is the total amount of money the government has borrowed, or, roughly, the sum of all annual deficits past. The most economically important measure of the federal debt isn’t the absolute dollar amount, despite politicians’ proclivity to cite the fact that it’s now several trillion dollars, but the size of the debt relative to the size of the economy, measured as the Gross Domestic Product (GDP). Before the Great Recession, the federal debt held by the public (a measure that excludes Treasury bonds held by the Social Security Trust Fund, because that’s money one arm of the government owes to another) amounted to about 35 percent of GDP. Today, it’s about 78 percent. 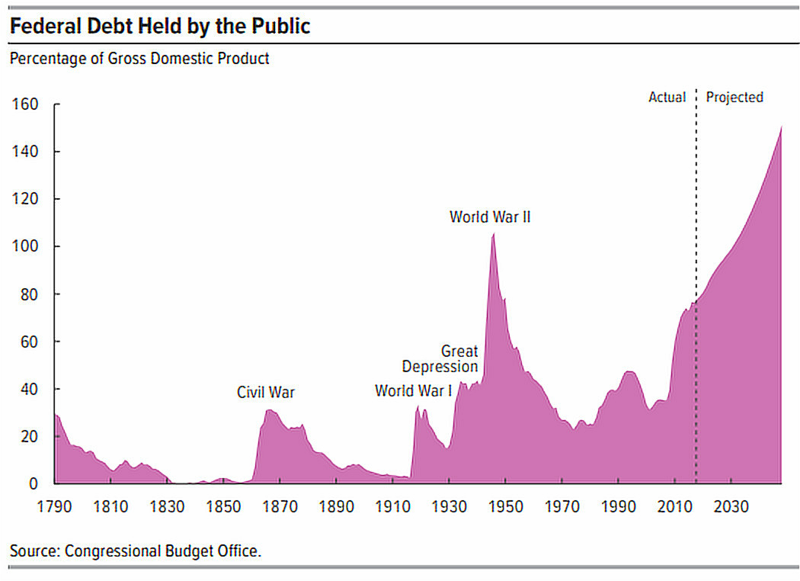 The Congressional Budget Office (CBO) projects that without a course change, the federal debt will climb over the next 20 years to 118 percent of GDP, exceeding the peak that followed World War II. Spending will continue to exceed revenues substantially in part because Congress cut taxes a lot in 2017 while increasing spending. Over the next few decades, the government will spend more on retirement benefits and health care because there will be more old people, and thus more beneficiaries. On top of that, per person health care spending will rise faster than the economy grows; the federal government directly accounts for about 35 percent of all health spending in the U.S. In short, the U.S. has promised to pay retirement and health benefits in the future that exceed the revenues the current tax code will produce. Faster-than-projected economic growth would make this problem smaller, but no credible forecaster sees the pace of growth quickening enough to stop the debt/GDP ratio from rising. Q: Is this rising debt causing any problems today, either for the government or for the overall economy? No. The federal government borrows about $100 billion a month with little apparent difficulty. The interest rates that domestic and foreign investment demand to lend to the U.S. Treasury have risen a bit lately, but remain low by historical standards. Today, the Treasury pays less than 3 percent a year on its 10-year notes; back in 2000, when the U.S. government was running a budget surplus, the Treasury was paying nearly 6 percent. 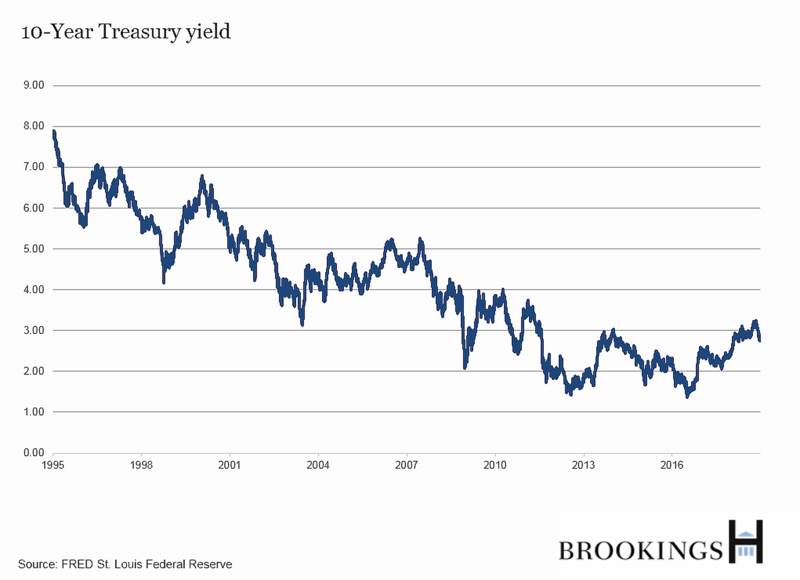 (Adjusted for inflation, the more economically meaningful measure, the 10-year Treasury yield today is about 1 percent versus about 2.5 percent in 2000.) Moreover, there are very few signs that this heavy federal borrowing is – in the jargon of economists – “crowding out” borrowing by businesses or restraining their investment spending. Q: Beyond the amount that the federal government is borrowing, does it matter what the government is borrowing for? It does. There are two good reasons for the government to borrow heavily. One is to support the economy in a recession, offsetting unwelcome weakness in consumer and business spending; that’s the case for the heavy borrowing during the Great Recession. The other is to finance investments that will pay economic dividends in the future – roads, bridges, broadband, scientific research, education, health care for children in poor families – as opposed to borrowing to pay for things that are consumed today, such as retirement benefits or most government salaries. Q: If the deficit isn’t doing any harm, why worry about it? Because the federal debt cannot grow faster than the economy forever. At some point, something will give. It could be the arrival of a financial crisis – often predicted, though it hasn’t shown up – in which investors abruptly decide that the U.S. government isn’t such a good credit. If that happens, the interest rates that investors demand to buy U.S. Treasury debt go up, pushing up the rates that households and businesses pay to borrow. Or foreigners, major lenders to the U.S. Treasury, might lose confidence in the U.S. and put their money elsewhere, provoking a plunge in the value of the U.S. dollar alongside a surge in interest rates. No one knows if or when such a crisis might occur. Changing the trajectory of federal tax and spending would reduce the chances of one occurring. 1. The U.S. government borrowed heavily to mitigate the devastation of the Great Recession, as noted above. If the U.S. is hit by another bad recession, or has to fight a costly war, or whatever, it isn’t clear that it will be so easy to borrow as much as it did in the late 2000s or, if it can, if it will have to pay very high interest rates to do so. Economists talk about the capacity to borrow a lot for an emergency as “fiscal space.” There’s no precise measure of how much fiscal space the U.S. has, but clearly there is less now than there was back in 2007. 2. So far, there are no signs that the borrowing by the U.S. government is interfering with the ability of consumers and businesses to borrow. Indeed, the Federal Reserve and others are uneasy that there may be too much lending to corporations. In other words, there are so many people and countries around the world with so much savings looking for a home that there’s enough to go around. No one can be sure how long this will last. Most economists expect higher budget deficits and rising federal debt to lead to higher interest rates eventually – even if there is no acute crisis. The risk is that federal borrowing will someday crowd out investment; the less investment, the lower the pace at which productivity and living standards rise. 3. The more the government borrows, the more of the federal budget goes to interest, which leaves less money for everything else (including government spending on R&D, education, infrastructure, and other public investments intended to pay off in the future). Already interest on the federal debt – $324 billion – exceeds annual spending on transportation, international affairs, employment, training, and social services. And since more than 40 percent of the federal debt is held by foreigners, particularly China and Japan, a lot of those interest payments go abroad. This, too, will erode the growth of U.S. living standards over time. 4. The longer we wait to put the federal budget on a sustainable course, the bigger and more abrupt the changes in government benefits and taxes will have to be. Changes are inevitable; the sooner we start, the more gradual and gentle they can be. One political reality: Congress, with good reason, is reluctant to cut benefits abruptly for current retirees and other beneficiaries; major changes to Social Security, for instance, are phased in over decades. The longer the government waits to make changes, the more Congress is likely to resort to raising taxes as opposed to cutting spending. Q: We’ve been hearing dire warnings about the debt for years. Is there a case for relaxing and deferring the belt-tightening? Yes. After all, if the bond market isn’t worried about the prospects for ever-greater federal borrowing, why should the rest of us panic? There’s no evidence that government borrowing is crowding out private investment and very little sign of an imminent increase in inflation that will overwhelm the Federal Reserve’s ability to manage it. As long as interest rates remain low – a big “if,” to be sure – the government can continue to borrow without doing much harm. CBO estimates that, if interest rates on federal debt were just 1 percentage point lower than the agency expects during the next 30 years, federal debt would be smaller by more than 30 percent of GDP at the end of that period. If interest rates are low – to be technical, if the key interest rate is below the economy’s growth rate – then there’s not much economic advantage to acting now or later to restrain the federal debt. With interest rates low, we can simply borrow to make interest payments, and the ratio of debt to GDP will still decline. A key question, of course, is how high can the debt go without interest rates rising above the GDP growth rate? 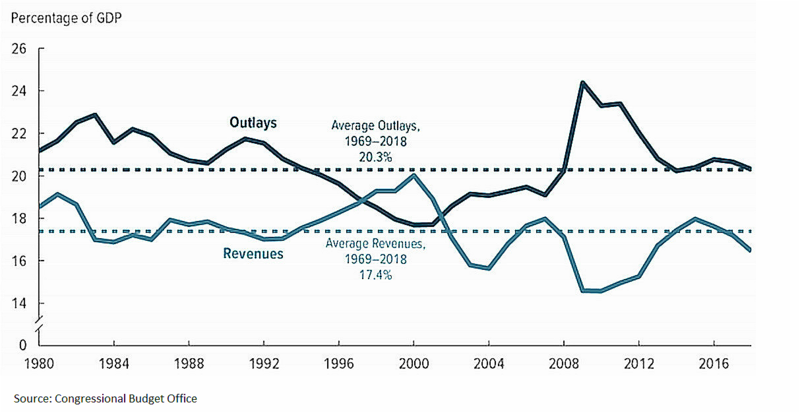 The case for putting off the pain of reducing future deficits by cutting spending and/or raising taxes is much stronger if the borrowing goes to pay for investment, as opposed to spending and tax cuts that go to current consumption. But to be clear: the issue isn’t whether the U.S. will need to raise taxes and/or cut spending to put the federal budget on a sustainable course and avoid a steadily increased debt/GDP ratio – it’s when. *Jeffrey Cheng contributed research support to this post.